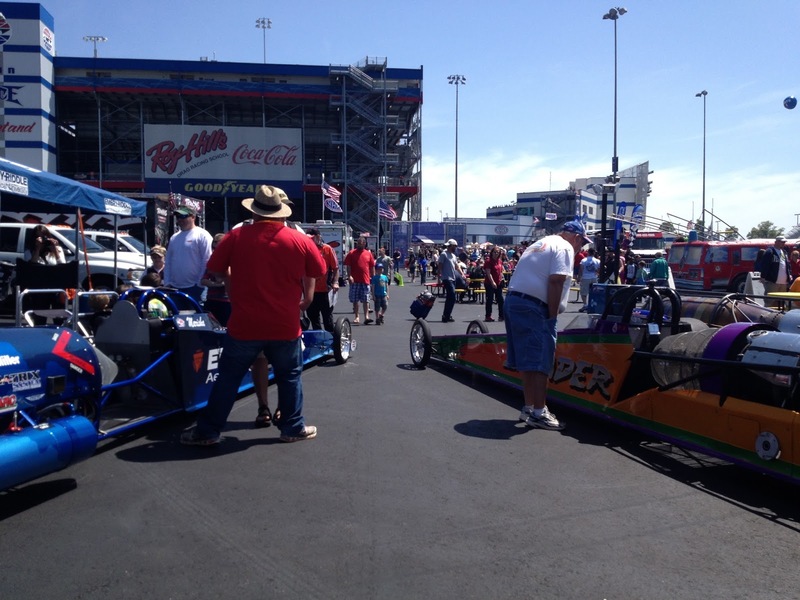 First race on the east coast tour was at Charlotte Motor Speedway zMax Dragway on 19th and 20th of April. After the final race at Firebird International Raceway, we loaded up the rig with what we would need for this extended tour because once we left the cars were not coming home until late August. 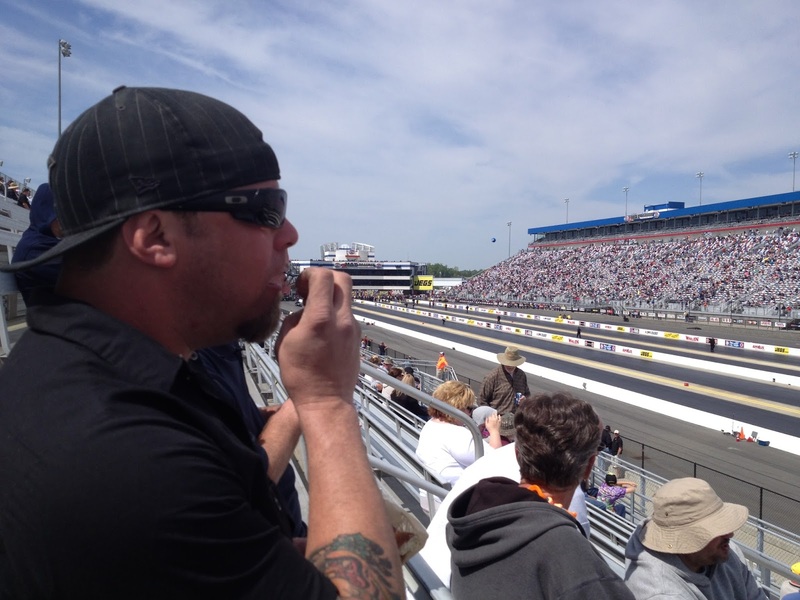 Steve headed out on a relaxing first leg out to zMax and pulled into the track on Tuesday prior to the event. The rig was parked and now it was the rest of our turns to make the trek east. Craig, Tony, and Curt arrived Thursday into the Charlotte area, looking to meet up with our good friends Chris and Elaine. Friday morning, we arrived at the track to the inspiring view that the Charlotte Motor Speedway complex is. All I can say is WOW! Larsen’s rigs and ours were in the NHRA Kids Fun Zone right at the front of the Nitro Midway. What a great location! 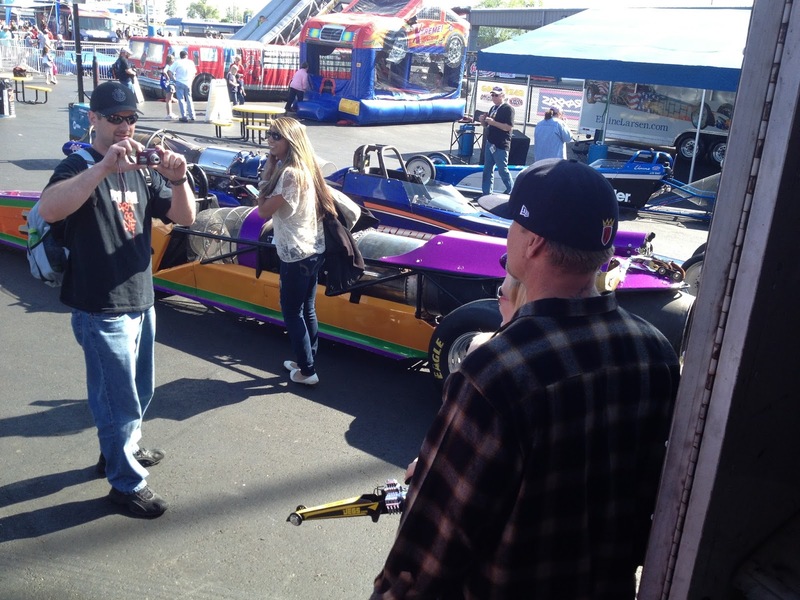 Four jet dragster on display for the four wide event! Miller “Power of Blue”, Embry Riddle Jet Dragster, Avenger Jet Dragster and the Invader all together were quite a sight to be seen. The cars were all prepare for the run scheduled at the end of the night qualifying season, inspected by the head of NHRA Exhibition committee to ensure all the new safety systems were installed and operational. After all four cars passed the inspection with flying colors, both teams set into the routine of greeting the fans, signing hero cards, posing for photos the smack talking began. Being this was the first match up with Marisha Falk and the JET FX team, it was the friendly messing with to welcome her to the family. But racing was not to be on Friday. The heavens opened up and let the rain pour in. 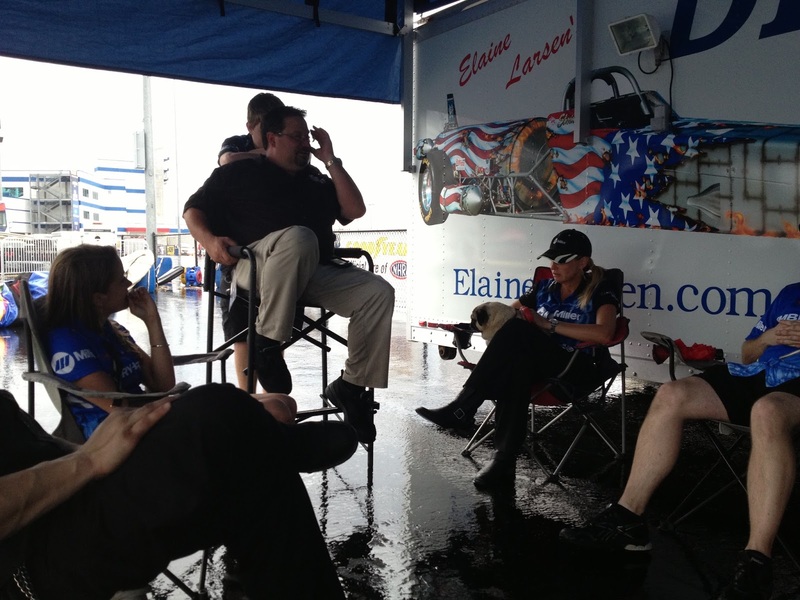 After a couple small sprinkles, the rivers started to flow and NHRA called it quits for the day. The teams loaded the cars back into their dry trailers for the night, and were off to dinner. After a good Mexican meal, it seemed to be Curt’s birthday as he was made to dance on a chair for some birthday treat. As this exhibition of non-rhythm, somehow the treat had disappeared to Elaine and Marisha’s end of the table. Saturday began without a cloud in the sky and stayed that way. The cars were again unloaded and on display for everyone to come as see. Throughout the day, many of the pro teams stopped by and looked over the vehicles asking questions on how they worked and why we would drive these beasts. 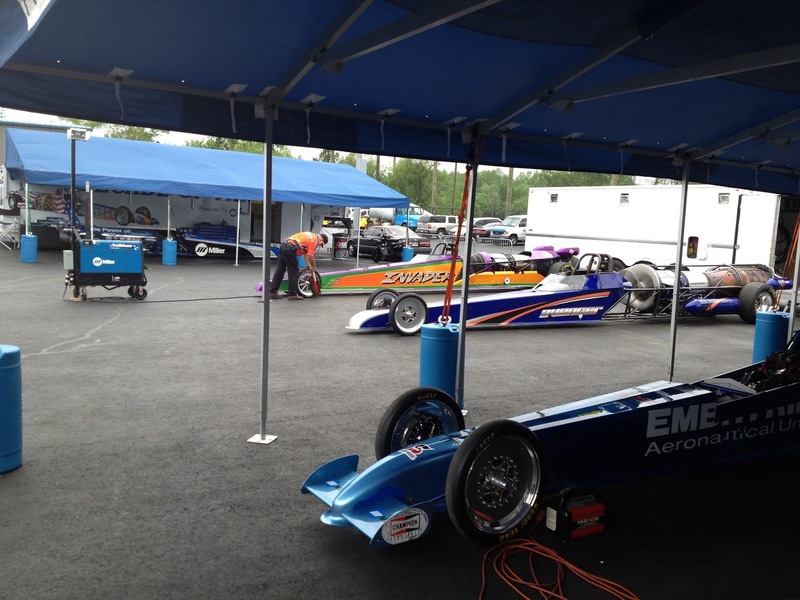 As the final qualifying season finished, the teams prepared and suited up for the four wide jet exhibition runs. Lane one was Craig Eierdam in the Avenger, lane two was Curt Eierdam in the Invader, lane three was Elaine Larsen in the Miller “Power of Blue” and finally in lane four Marisha Falk in the Embry Riddle car. Track personnel gave us one last instruction on the staging procedures unique for the four wide track, and then we were off. After start, Craig had an issue in the Avenger and for safety had to shut down, so it was up to Curt to battle the ladies for bragging rights. With great weather and super corrected altitude, the Invader was set for a fast pass or so they hoped. The conditions were so unlike the team was used to out west, so this was going to be a guess at the tune-up. Fire show and burner pops completed, the three remaining cars pulled in and staged. All the smack talking must have worked, as Marisha red lit with Elaine right along with her. Curt was able to chase them down running a 5.52 289 mph to Elaine’s 5.80 279 mph and Marisha 5.98 268 mph. That ended the event for the day and the jet’s for the weekend as Sunday was the race day for the pro’s. 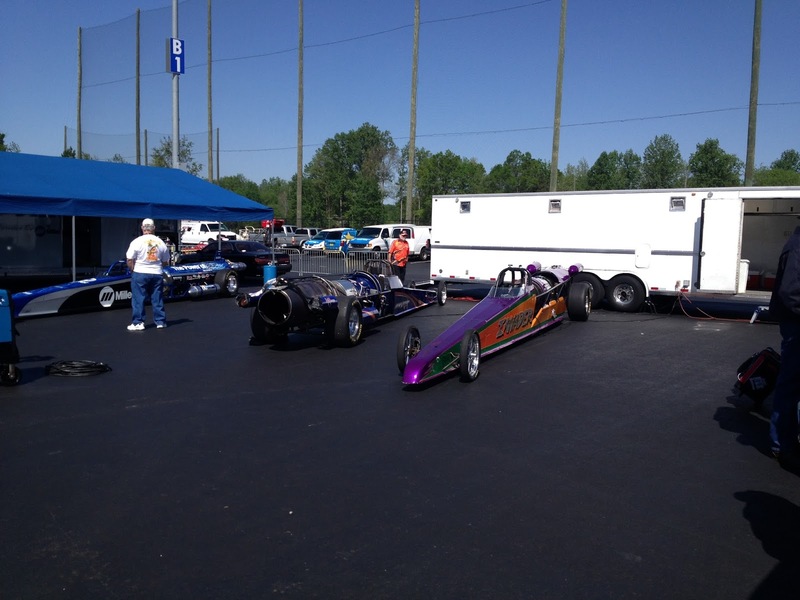 JET FX came out, fixed the Avenger’s problem and watched a few rounds of eliminations on Sunday before heading out. Steve and the rig headed to our Midwest base in Indiana, while Tony, Craig and Curt had some flights to catch. Not a terrible start to the east coast tour but….